February 8, 2016 by fmgarchitects. What are the walls of Dublin houses made of? 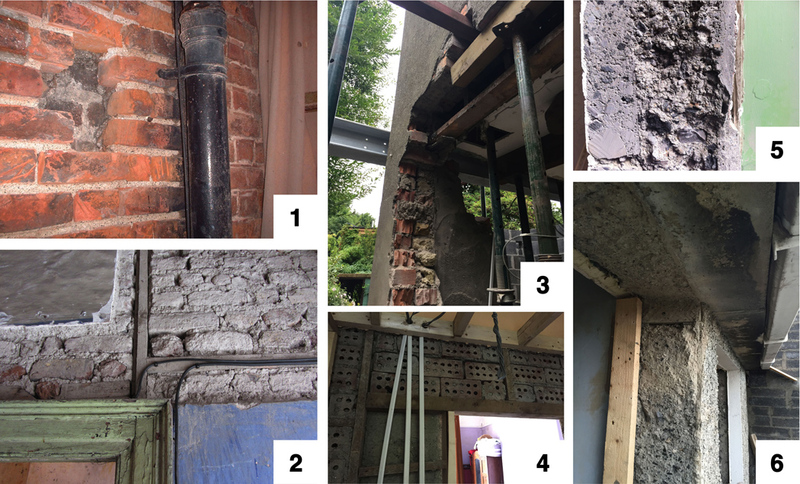 Following the demise of timber-framed house construction in Dublin in the 17th century, the use of brick construction established itself in the early 18th century supported by an act of parliament in 1730 that stipulated quality control measures for local brickmaking. The houses of the 18th century Georgian housing boom were typically laid out in solid brick walls above stone-built basement levels with walls varying in thickness according to the brick wythe module. The facing brick of Georgian houses was typically of better quality than the “place” bricks used for the external wall substrate and internal walls which received a plaster coating. The outer facing skin was often separated from the wall behind by a working joint which is often evident during façade works. The single-leaf form of wall construction was carried into the Victorian and Edwardian eras (albeit with the facing brick skin better integrated into the external wall) until new methods of construction emerged in the early 20th century. There was a distrust in the market at the time for new construction methods and private housing appears to have retained traditional construction with brick facing for longer that it public counterparts, with “pre war specification” often being promoted in sales literature. There was an awareness of the issues of moisture penetration relating to single leaf wall construction at the time (see the PC Cowan report on 1918) and the use of cavity walls of concrete block construction was in place by 1918. Solid concrete or concrete block walls were also in use as well as were experimental systems (Kessel system – Marino, Orion system -Middle Third, Coloway system – St Barnabas Gardens) that typically were finished externally with dash or smooth cement renders. North Great Georges Street (1770) – working gap and mis-alignment of coursing between facing bricks and place brick wall substrate evident during façade restoration. Henrietta Street (c1750) – internal entrance hall loadbearing wall construction of hand-made brick with bonding timbers. Clontarf Road (c1900) – industrial brick single-wythe wall to return of Victorian house. The bed mortar of the return was particularly weak and made the propping of the upper floor of the return difficult. Clontarf Road (c1900) – non loadbearing partition wall. The wall was poorly constructed with brick-on-edge loosely bedded between framing timbers. The plaster finish had de-laminated from the wall due to an absence of lathing. Bulfin Road, Crumlin (c1930) – mass concrete wall construction. The mix and colour of the concrete varied with each lift showing a lack of consistency during the original build. Hardiman Road, Drumcondra (c1930) – mass concrete wall construction with integrated concrete eaves. Is this all taken from BTL, or could some of it be added? There are additional images and notes from some projects over the last year which we could use? Where could I get more info on the Kessel System used in Marino? How would this system compare with more recent natural building systems e.g. hempcrete in terms of performance, cost, availability of materials, complexity of build? I believe the Kessel System was German prefabrication system. That’s all I know about it. I can’t comment on how it would compare to other systems.